If you are looking for a medium to large sized slow growing tree with great autumn colour the Nyssa sylvatica could be the one. The commonly grown Nyssa Sylvatica or ‘Tupelo’ are a great feature tree for the garden. From North America these are a deciduous tree of pyramidical shape tending towards rounded with age. Commonly called the ‘Black Tupelo’ Nyssa sylvatica is upright in growth habit at first, forming a spreading crown as it matures. 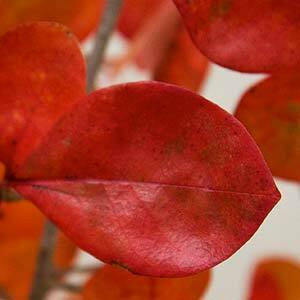 Deep green glossy foliage that turns a brilliant red in autumn. The colour is better in colder climates. Used in landscaping as a street tree as well as in parks and larger gardens this is a hardy tree once established. Excellent in urban conditions where it tolerates pollution and soils that are less than well drained. The increasingly popular Nyssa Sylvatica or Tupelo tolerates both wet and dry sites. Nyssa Sylvatica will grow to a height of 10 – 20m and has slightly drooping or down swept branches with strong autumn colours contrasting with a dark trunk and branches. The crown will spread to around 6m across over time. Nyssaceae Ogeechee is suitable for wet sites.